Exclusive interview of H.E. 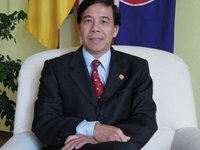 Chuah Teong Ban, Ambassador of Malaysia in Ukraine with Interfax Ukraine Q: How do you evaluate the relations between Ukraine and Malaysia? A: Malaysia is among the first countries to recognize the Independence state of Ukraine. The 20th Anniversary of our diplomatic relations will be celebrated next year. Since that time we have signed several bilateral agreements. Two of them, I believe, are the most significant ones, namely, Trade Agreement and Memorandum of Understanding on Cooperation in the Defence Sphere. Many more agreements such as in the field of education and science, avoidance of double taxation and partial abolishment of visa regime are still pending. Some progress has been made in the negotiations of these agreements, but there are still much work to be done. Further, I would like to point out that we are actively following the trends in foreign policy of Ukraine and to our pleasure I must admit that there are some signs of diversification in foreign policy directions of President Yanukovych. Besides the traditional international policy priorities such as EU integration, active bilateral cooperation with Russia and the U.S., Ukraine’s government has begun to show some interest in East and South East Asia. Good examples are the visits of President Yanukovych to China last year and also to South East Asian countries early this year. My country strongly supports such policy shift and I personally hope that Malaysia will be included in the next visit of President Yanukovych to the South East Asia in order to increase our cooperation for mutual benefit in a long term basis. Q.What is trade volume between our countries? What is the trend? A. The trade turnover was rapidly growing before the 2008 economic crisis hit Ukraine. After that, we witnessed a considerable slowdown. Nonetheless, thanks to our continuous promotional efforts undertaken in the recent years, trade volume has slowly improved and is now catching up to the pre crises level. In 2008, total bilateral trade amounted to USD365.4 million, whereas in 2009 it plummeted to slightly more than USD 228 million. Since then, we witnessed a moderate growth in our turnover. However, for the first nine months of 2011, our bilateral trade has reached USD 309.5 million which is almost doubled compared to the corresponding period of the previous year. Q.What are the main export commodities between our countries? At the moment, the bilateral trade balance is in favour of Malaysia, with Malaysian exports comprising the biggest share. Malaysia’s main export items to Ukraine are palm oil, electronic components, medical disposables, polymers and some home furniture. I must say, over the years, Ukraine has significantly improved its bilateral trade share with Malaysia. Comparing to the figures of 2010, Ukraine has added up some 275% of export volume to Malaysia. Among the major export items to Malaysia are chemicals and chemical production, mineral fertilizers and stainless steel products. Q. The question on palm oil exports, existing problems. As I have mentioned earlier, palm oil is the main export item of Malaysia to Ukraine, comprising up to 37% of total bilateral exports last year. Over the recent years, export of palm oil to Ukraine from Malaysia has declined slightly. The declining trend was attributed to mainly the natural economic processes such as competition from other neighboring palm oil producing countries. There is also some competition from other edible oil producers such as soybean, corn and sunflower oil. Against this background, Malaysian palm oil retained its advantage as Malaysia has the well-developed facilities for refining crude palm oil and the advance technology and research know-how on this edible oil. Q.Is Malaysia interested in defence and space industry cooperation with Ukraine? A: Malaysia is interested in cooperation with all friendly countries including Ukraine in the military and defence industries sphere. Traditionally, we have been buying military equipment and technologies that conformed to NATO and Western European format. However, over the last decade, Malaysia has started to buy some weaponry from CIS countries, namely MiG and Sukhoi aircraft from Russia and military communication systems from Ukraine with a view to diversifying Malaysia’s defence profile and capability so that Malaysia is not too overly dependent on one-source of defence procurement. Our interest in defence industry can be clearly demonstrated from the commitment of Malaysia in hosting the biannual international exhibitions such as International Maritime and Aerospace Exhibition in Langkawi (LIMA-2011) which will be held in early December this year and also the Defence Services Asia Exhibition and Conference (DSA) taking place in April 2012. In this regard, I have personally conveyed an invitation to Defence Minister of Ukraine, H.E.Mykhaylo Yezhel from his Malaysian counterpart to take part in this forthcoming LIMA-2011. I am confident that the participation of Ukrainian defence consortium UkrOboronProm supported by the official visit of the Minister to LIMA-2011 will send a strong signal on Ukrainian interest in forging strong bilateral cooperation in defence area with Malaysia. Besides defence industry Malaysia is also interested in the aerospace domain. Malaysia’s involvement in the aerospace started in 1996 when Malaysia launched the first privately owned satellite MEASAT-1 into orbit aiming to provide direct-to-user television and general communications services for the region Malaysia-Philippines and Beijing-Indonesia. Since then, three more satellites have been successfully launched. In 2007, a first Malaysian astronaut went to space on board Soyuz TMA-11. In pursuit of this aerospace programme, Malaysia is willing to work with Ukraine in the relevant aerospace industry. Q. Are there are any plans of Malaysian delegations visiting Ukraine? Is Malaysia considering a visit of the King or Prime Minister of Malaysia visiting Kyiv? A. Since 2003, we have had ministerial-level visits to Ukraine almost annually, which includes Prime Minister of Malaysia, Foreign Minister, Defence Minister, Tourism Ministers and other high level officials. The most recent official visit was a trade promotion mission led by Minister of Plantations and Commodities in 2010. However, there appeared to be an imbalance of exchanges of bilateral visits at ministerial level. To date, many visits from Ukrainian side to Malaysia were at the highest Deputy Ministerial level. I look forward to seeing a full Ukrainian Minister making visit to Malaysia soon as my government has issued several invitations to Ukrainian political leaders as well as Ministers. Q: Representatives of the USA and other European countries are quite actively commenting the trial of Mrs.Tymoshenko through their Ambassadors accusing Ukrainian side of bias approach and even totalitarian governance. What is your position in this regard? Malaysia has always adopted the policy of non-interference in domestic affairs of another country, except that when there is grave concern such as aggression against humanity and human rights injustice such as in Palestine. We believe that free and fair trial should be given to any accused and it should be free from any political motive in line with international law and democratic principles. I believe, the democratic process should be executed through the ballot box by the people in a free, fair and open manner. Q. How many tourists from Ukraine have visited Malaysia in 2010? What is the trend for the current year? A: Malaysia ranked 9th globally and 2nd in the South-East Asia in terms of receiving tourist arrivals, which amounted to 24.6 millions in 2010. Tourism industry is also the third foreign revenue source for our economy. Some 3,000 Ukrainian tourists spent their holidays in Malaysia last year thanks to the visa-free policy of Malaysian government for Ukrainian visitors on short stay in Malaysia. I am confident that the tourist arrivals from Ukraine will continue to grow in the coming years as more promotional efforts are being undertaken continuously by my Embassy as well as Malaysian Tourism Promotion Board. Q. Will there be direct flights between Kyiv and Kuala Lumpur which will obviously improve the tourist flow as well as business interests? A: No doubt that the availability of direct flights between Kyiv and Kuala Lumpur will have a direct impact on the bilateral tourist flows as well as business interest. However, as the airlines industries are profit-oriented entities, naturally cost-effective principle comes into play in making sound business decisions. Given that the tourist market flying to Malaysia and vice-versa to Ukraine is still not large enough to be viable, I do not foresee such direct flights operating between Kyiv and Kuala Lumpur in the near future.